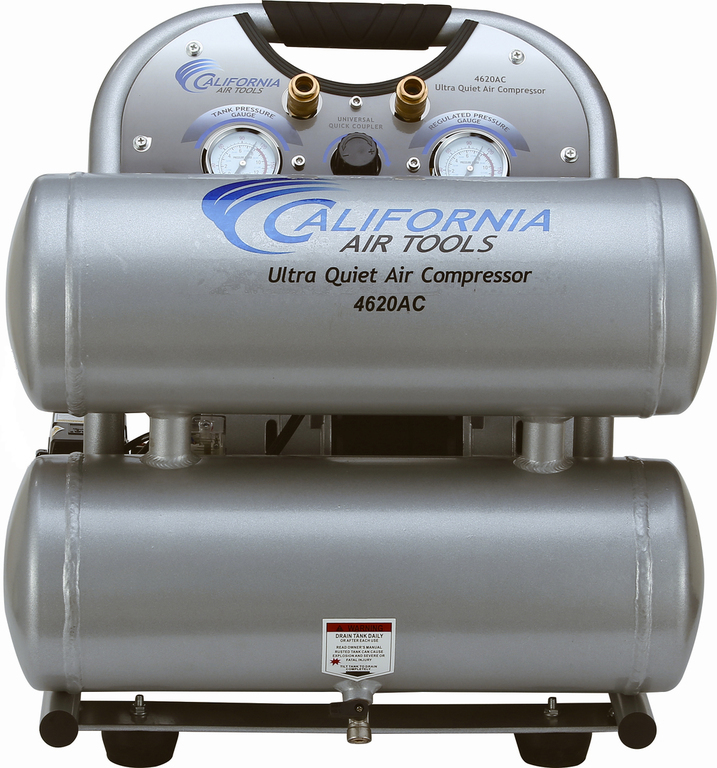 Dimensions: 19.1" x 16.7" x 19.7"
The California Air Tools 4620AC Compressor is your way to get an air compressor that would be compact enough to move it around and transport while providing sufficient air pressure for your projects. This model will be the best choice for individuals or contractors who look for a quiet compressor for indoor use but which is still possible to put out. As any piece of California Air Tools product line, it is designed to deliver maximum performance along with enhanced functionality. The 4620AC Compressor belongs to the Ultra-Quiet series from California Air Tools Inc. Which means that it has been developed as one of the most silent running air compressors by the company for a highly reliable, durable, and efficient operation. Given that all air compressors from Ultra-Quiet series are oil-free, they are still able to provide a powerful operation that is quiet enough to let you comfortably talk during work cycles. Besides, oilless operation enables you to use the compressor even if it is in cold environments and stands on the uneven surface. Among other benefits of using oil-free air compressors from California Air Tools, it is possible to mention their simple maintenance as they do not require oil changing, refilling, or disposal. Also, using oil-free air compressors won't damage sensitive items. What is more, these air compressors have a number of useful features that make them extremely durable and powerful. 4-pole motors which operating speed is only 1680 RPM. Thus they create less vibration and thereby less noise which in turn allows for less wear of the motor itself. Aside from that, the manufacturer has made these motor brushless what also helps to reduce motor wear. Low amp draw allowing for less electricity consumption and the easier start of the motor. Dual valve plate design that is specially developed for increased output. Stainless steel reed valves add more durability and rust resistance to the motor, thus ensuring a longer service life of the motor. Pressure switch, which serves as a thermal overload protection. In case the air pressure in the tank rises to the maximum value, it automatically turns the motor off. In the same manner, it starts the motor again when the pressure lowers to its minimum. This feature prevents the motor from overheating that also prolongs its life. Extra large dual pistons enable the compressor to fill up the compressor air tank and recover faster. Many customers already enjoy working with the California Air Tools 4620AC Compressor. They like its relatively lightweight, quietness, and a quick and easy-to-assemble startup. That said, it is compact enough to take it along with you in the backseat of your car. 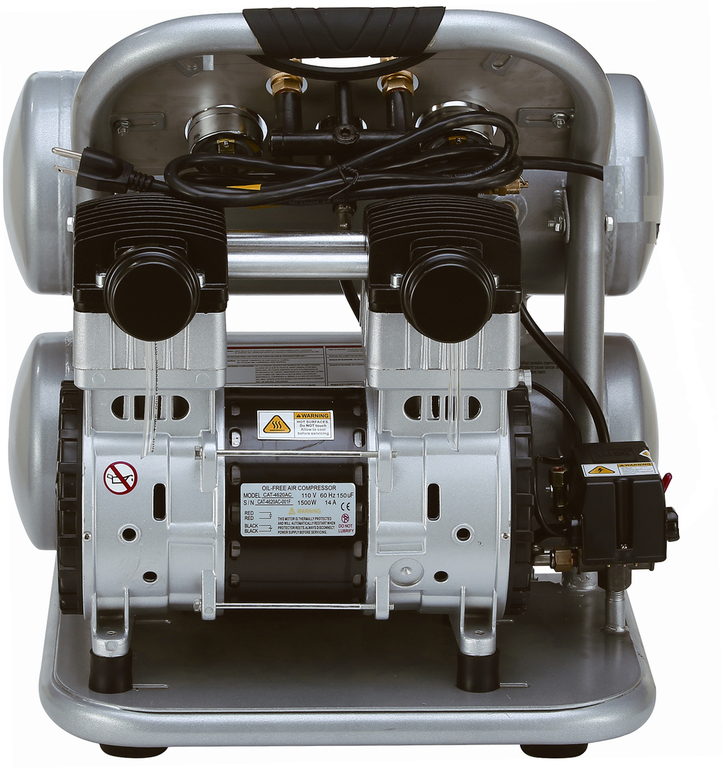 Generally speaking, this California Air Tools 4620AC is a nice compressor model that optimally combines powerful operation with silent running and portability. Dimensions: L 19.1" x W/D 16.7" x H 19.7"
On top of that, the California Air Tools 4620AC Compressor features a standard 1-year manufacturer's warranty that is valid from the date of purchase. This warranty allows for free repair and replacement of parts that the manufacturer finds defective. 19.7" x 19.1" x 16.7"